Tower Bolt, Size (in inches): 4"
Size (in inches): 4", 3", 6"
With rich industry experience and knowledge, we are providing an excellent quality range of Metal Tower Bolt. We are engaged in the manufacturing wide range of Forged Steel Screw. We at Vishwakarma Product brand name LOOK offer high quality products that meet the specific requiremets. 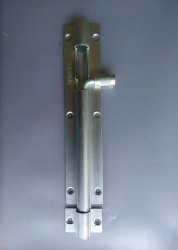 We are specialist for Brass Hinges, Tower Bolts, Window Stays, Gate Hooks, Glass Fittings, Cabinet Knobs, Handles, Main Door Handles and many other architectural hardware of very high quality products.